Charming townhome in highly desirable Mountain Gate. This 2 bed 2bth home boasts lots of light, high ceilings.& open floorplan. Mstr suite features private office & peaceful outdoor patio w/water feature/Jacuzzi. Mstr bath is beautifully remodeled w/ lrg walk in closet and custom built-ins. 2nd bdrm has built-in & en-suite. OPEN HOUSE! 1124 N LA CIENEGA BLVD. #205 WEST HOLLYWOOD. Contemporary 2 bedroom/2 full bath condo located in the heart of West Hollywood! Features an open living and dining area with recessed lighting, bamboo floors, modern chef's kitchen with stainless steel appliances & built-in bar. 2 large bedrooms including an ensuite master & large closets. Comes with 2 rarely seen side-by-side parking! Don't miss this investment opportunity to own a unit located steps away from shopping & restaurants on Sunset & Santa Monica Blvd. Located in both Lanai & Hesby + close to LA’s Best Private Schools. Close to everything, this Cape Cod Contemp AMG Capital Custom home is located on an idyllic tree-lined street Sth-of-the-Blvd in prime Sherman Oaks/Encino location. Best of both worlds! Step in & your senses are invited to feast on all of the best modern design & finishes w/attention to every detail that is characteristic of this much sought after style home; soaring ceilings & wide-open spaces thru-out, perfect for the modern family dynamic. A dream stadium chef’s kitchen w/dual carrara marble islands, Viking Appliances, Dual Frig, Bar & 750 Bottle climate-controlled wine room flow seamlessly w/family room & outdoor entertainment/pool areas. Lush Screening room w/sound fabric walls, dining room, guest bdrm/en suite & full laundry room complete the downstairs area. Enjoy tree-lined views from the luxurious master suite with ample balcony, 3 add’l big bedrooms all en suite, game room + homework/creative station upstairs. Ample outdoor area w/pool, outdoor kitchen, outdoor shower & bathroom, multiple dining areas & beautiful drought resistant landscaping make this the perfect home for chilling with family & friends or entertaining for special events! This is not one to miss!!! Tucked in the scenic rolling hills of Encino, this spacious and charming American Farmhouse-inspired residence offers an ideal blend of original style, upgraded amenities, and abundant space for gracious indoor/outdoor living. Shingles, brick and dormer windows complement the home's handsome exterior, which welcomes guests indoors beyond an old-fashioned covered front porch. Remarks: Beautiful Storybook Mid-Century sprawling Ranch Home, situated on a huge flat private lot, almost 20K, oozes charm & warmth. 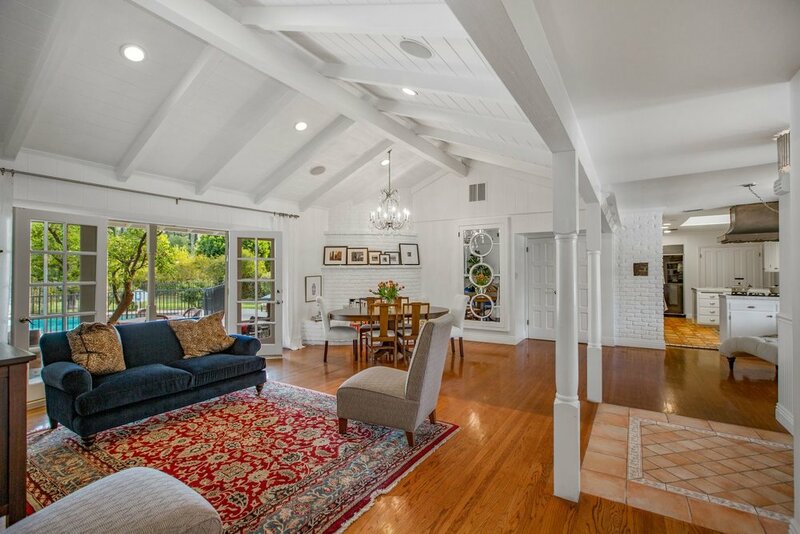 This characteristic Tarzana home, w/over 3200 sq ft, functional flr plan w/vaulted ceilings, wd flrs & wide/bright open spaces, perfect for a family that loves to entertain. Main house has 4 Bdrms & 3 Baths. 5th, completely built-out bonus room, w/closet, perfect as an Office or home gym. The Master en suite, has views of the backyard & pool. Over-sized living areas w/bar. Spacious Formal Dining Room. Extra large Family Room w/French Doors leads to an idyllic backyard w/outdoor dining & TV area. Picture book multi-pane windows all look out to the park like grounds w/entertainer's patio area, salt water pool, and plenty of green space. The front and back yards are beautifully landscaped & include an array of Citrus, Peach and avocado trees w/wide circular driveway. Energy conserving Solar panels are in place. Huge, wide flat lot-great opportunity for expansion! Agent Remarks: Listing is being managed by relocation company, CARTUS.Title & Escrow are assigned by the relocation company. Buyer shall submit an offer using the Residential Purchase agreement & seller will either counter or agree upon verbally. Once there is an agreement, a new contract of sale will be distributed by Cartus. Solar panels currently being leased & buyer shall assume lease & maintenance costs. Please include Fico Score, POF, and Pre-approval Letter from Lender. All offers can be emailed to askloangelo@gmail.com. Property is sold in its "As Is" Condition. Seller makes no warranties, express or implied. Buyer and Buyers Agent to verify all information, including square footage, schools, and rely on their own findings. Single-story Mid-Century Ranch home in Encino's Blue Ribbon Lanai school district. Set above the street, up a private driveway, on a secluded, private 15K sqft lot. This characteristic SFV home features 3 bdrms and 3 bths. The open floor plan & architectural integrity, indoor/outdoor flow will take your breath away! Highlights include high ceilings with exposed beams, a gourmet kitchen w/granite countertops, breakfast nook, original hardwood floors and stone fireplaces. Plenty of room to expand! Enjoy outdoor entertainment in the big backyard w/a resort-like pool and patio. This home has convenient access to all the best area private schools, quick jump to the West side, Valley and the 405 freeway. This perfect Sth-of-the-Blvd home in an idyllic setting awaits you and your family. Don't miss this one! Built by a Hollywood set designer, this Tyrolean storybook Swiss Chalet stands the test of time. Drive up a secluded, lush green tree-lined street of the Verdugo Woodlands Neighborhood. Here your attention is captured by the beautiful detail & craftsmanship of a home set back amongst the hills.The front door leads into living rm w/hi ceilings w/repurposed beams, peg & groove wd flrs, stained glass windows & anchored by wood burning fireplace. The exterior features of the home include hand drawn address and details thruout, lush garden flowers and grass and plenty of eye catching feature...s. This property offers 3 bedrooms, 2 bathrooms in a 1,850 sq. ft. The kitchen features incl. imported Mexican tile, stainless steel appliances, wd beamed ceilings & detailed accents. For change of scenery, take steps up thru the lush pine & citrus trees & reach a flat pad & enjoy a wood enclosed above ground solar heated pool dressed w/a wooden deck and speakers for sipping wine & peaceful canyons views. Timeless Architectural masterpiece in prime Mulholland Estates, Richard Landry A.I.A. Once owned by John Fogerty, this spectacular Estate, reminiscent of homes on Lake Como, sits on over half an acre w/hypnotizing canyon & city views from every room on every level. Multi-paned windows, prism glass & solid stone create the perfect blend of Contemp & classic elements. Secluded & private, over-sized Terraces look onto the lush backyard, pool & expansive city views. Towering ceilings & doorways w/grand staircase, wood-paneled library w/custom built-in bookshelves; Living room w/ fireplace opens to entertainer's patio & city views. Kitchen has granite counters, large center island & breakfast nook w/separate catering prep area located between formal dining room & main living room. Oversized entertainment room features full bar area & covered patio w/outdoor kitchen grotto. Upstairs, a privately positioned master suite with gorgeous views, his/hers walk-in closets, steam shower & soaking jacuzzi tub. 3 add'l upstairs bed rooms w/walk-in closets & en-suite bath rooms. Lush outdoor areas feature pool/spa & expansive views everywhere! Exquisitely Remodeled Mediterranean Villa in Lower Bel Air. Rebuilt from the studs in 2004 with highest quality materials and great attention to detail. Over 3000 SQ. FT. of usable space. Less than three minutes from Sunset Blvd., 5 bedrooms, 4.5 Bathrooms, large living room, entertainers dream home, fabulous back yard and secure pool. Come live in the lap of luxury. In the coveted Roscomare school district & close to all the best private schools LA has to offer on Westside & Mulholland Drive. PHENOMENAL PRICE FOR REMODELED CONDO IN PRIME VINTAGE WEST HOLLYWOOD BLDG, LUSH TROPICAL COURTYARD LANDSCAPE W/ 3 FOUNTAINS! GREAT REMODEL WITH CONTEMPORARY FINISHES, CEASAR STONE COUNTERTOPS. RARE PRIVATE GROUND-LEVEL PATIO. WALLS OF GLASS. NEW PERGO FLOORS, SEMI-CIRCULAR BAY WINDOW, BRIGHT. SOME OF LOWEST HOA DUES IN WEHO .